Cells respond to a variety of stimuli by releasing extracellular membrane vesicles (EVs), which are found in blood and other body fluids. 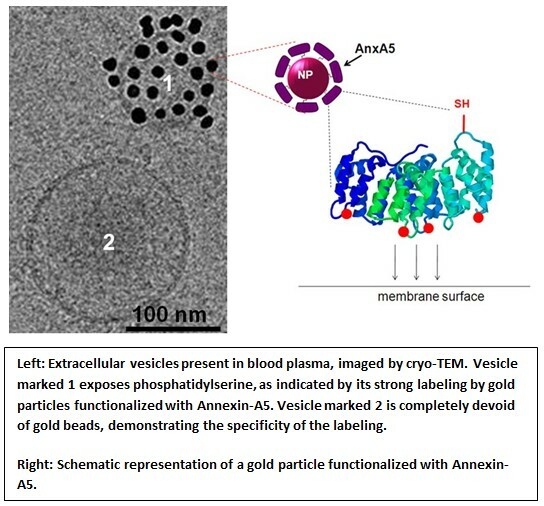 Two main types of EVs are commonly distinguished depending on their mechanism of formation and their size: the microparticles that originate from cell plasma membranes and range in size from 100 nm to 1 µm, and the exosomes that originate from multivesicular endosomes and are smaller (50 to 100 nm). There is now increasing evidence that EVs contribute to many aspects of health and disease. In blood, EVs participate in physiological processes of coagulation and inflammation via the presence at their surface of phosphatidylserine, tissue factor and other bioactive molecules. In addition, elevated levels of EVs of vascular origin have been found in numerous pathological disorders, including cardiovascular diseases, cancer, sepsis and autoimmune diseases. Intense research focuses on a better understanding of the mechanisms of EV formation and on their physiopathological roles, as well as on the development of biomedical applications as disease biomarkers, drug delivery vehicles or vaccines. It is therefore necessary to accurately characterize these objects in plasma from healthy individuals to be able to detect differences with disease state. A recent work using cryo-transmission electron microscopy (cryo-TEM) provides a near complete description of EVs from plasma. Furthermore this work demonstrates that flow cytometry, which is currently the main method for studying EVs, detects only about 1% of them. This work constitutes a reference for further studies and opens avenues towards the use of EVs as disease biomarkers. Reference : N. Arraud, R.Linares, S.Tan, C. Gounou, J.M. Pasquet, S. Mornet & A.R. Brisson. Extracellular vesicles from blood plasma: determination of their morphology, size, phenotype and concentration. Journal of Thrombosis and Haemostasis, (2014), 12, pp 614-627.